This photo shows a specialised refrigerator, used for cooling objects to within a fraction of absolute zero, located in the Physics building on UCL’s main campus. When in operation, the refrigerator is entirely enclosed in a sealed and insulated housing, which has been removed here for maintenance. As with a household fridge, the temperature drops as you go down – with the highest of the four shelves being at a temperature of about 50 Kelvins (-223 Celsius) and the bottom one at just 0.03 K (-273 C). 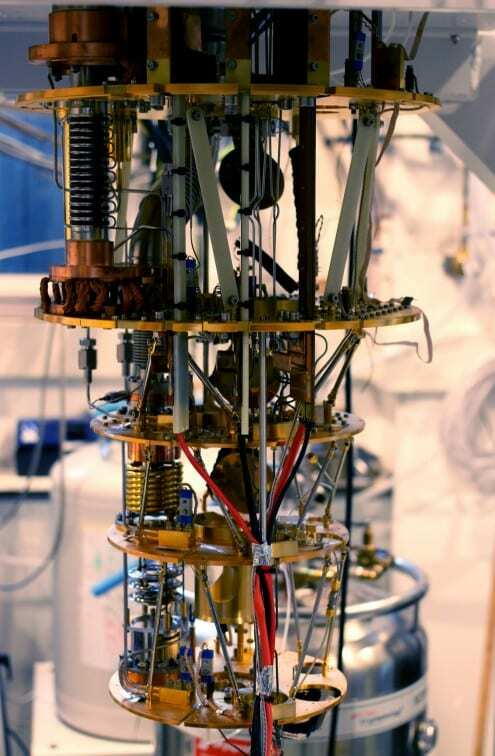 The refrigerator is used to cool small objects, such as transistors, down to levels where thermal effects (such as the vibration of the atoms in them) are eliminated, allowing quantum effects to be observed. Samples can be raised or lowered through each shelf via a circular hole in the centre of the refrigerator. The refrigerator is cooled by a mixture of liquid Helium-3 and Helium-4. The lowest shelf of this refrigerator has a strong claim to being the coldest place in London (alongside a handful of similar facilities at other London universities).